My six-year-old daughter loves oven roasted Jerusalem artichokes, and that’s a good thing, since they have taken over our garden. I call Jerusalem artichokes our survival food, as they grow so easily, spread like wildfire, and are ready for eating throughout the winter and early spring. Sure, they are a pain to clean, but that is a small price to pay for a homegrown meal in the winter. My family will never starve, as we always have Jerusalem artichokes. Jerusalem artichokes are not artichokes, and they do not come from Jerusalem. They are often called sunchokes, as the plant grows very tall in the summer and blooms a golden flower. Sunchokes are native to the eastern US and were first cultivated by Native Americans, although they don’t take much cultivation, in my experience. According to Wikipedia, “Jerusalem artichokes have 650 mg. potassium per 1 cup (150g) serving. 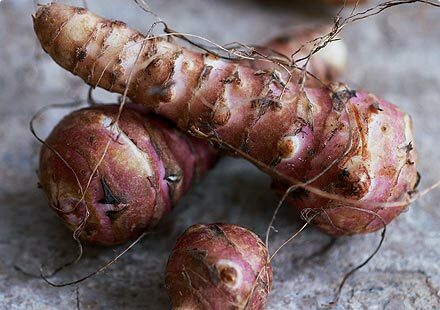 They are also high in iron, and contain 10-12% of the RDA of fiber, niacin, thiamine, phosphorus and copper.” Jerusalem artichokes offer an important source of potassium for those trying to follow the 100 Mile Diet and thus avoiding bananas. Wash and cut the tubers into about 1/2-1 inch pieces, the more uniform, the better. Place the cut sunchokes in a glass baking pan and drizzle with olive oil. Salt and pepper to taste. Add crushed garlic (2-3 cloves for a 9″ x 13″ pan). Bake at 400 degrees for about 40 minutes, stirring occasionally. The cooking time depends upon the size of your tubers and your taste. Some people like their sunchokes a little crunchy, some like them soft. I usually cook them for 60 minutes, but my friend, who gave me my original Jerusalem artichokes for planting, would balk at such “over cooking”. Once, I forgot I had them in the oven and really overcooked them. They actually turned out tasty this way, so you will need to experiment with your own preferences for cooking times. Note: If you don’t want Jerusalem artichokes taking over your garden, be careful about putting the uncooked cut pieces in your compost…this is how they spread throughout my garden. Also, chose a planting site wisely, as they will naturally spread. For more great recipes, please visit Green Options new blog: Eat. Drink. Better. Hey just stopping by to get my dose of green info. Always good stuff here! Love it. Mmmm, sounds simple and delicious! Can’t wait to try it! Wow, I’ll have to plant some this year. I’ve seen them at our local natural foods store, but never knew what they were. I’m so excited to try them now. i very love natural foods..
I’m a little bewildered?! Does one peel a jerusalem artichoke as a potato or ? No need to peel, but I don’t peel potatoes either. The skin is full of vitamins! Thanks, Jennifer. Actually, I don’t peel potatoes either. The pictures of jerusalem artichokes look ‘dirtier’ than most potatoes I’ve come across. I’m looking forward to giving them a try soon. You do have to really scrub the Jerusalem artichokes well. then use the veg when needed. The lemon keeps it whiter.